Is Bumgarner the Giants' Barry Bonds 2.0 for 2010s? #PEDs | Where Did You Go Joe Dimaggio? – He’s got plenty of attitude, which can affect team players, manager and opponents; now other teams can’t wait to beat him with team players less wanting to support him . The more we see Madison Bumgarner in action the more we see a parallel with good old Barry Bonds (our opinion). For all the good he may have done for the Giants in the past, Bumgarner, allowed to ‘do his thing’ ala Bonds, is now costing the Giants big time. 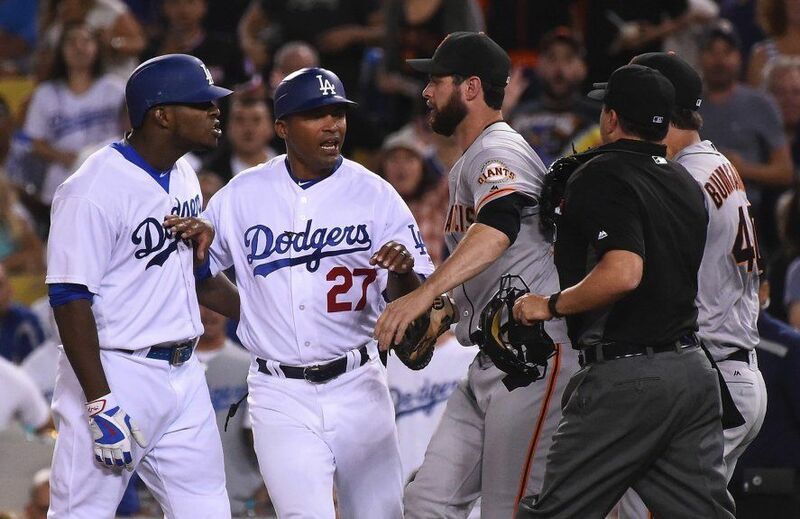 Monday night’s ‘sure win’ was not to be following Bumgarner’s altercation with the Dodgers and it may have been the last real chance for a Giants turnaround into the playoffs this season. For the first time, Bumgarner was collared and not allowed to finish the game- reasons still unclear and kept from the media as of this writing. That alone presents a problem of transparency, something on which the Giants have long tried to pride themselves, going back to Bonds. So, we see the top player , whether it be Barry Bonds with his recliner in his double locker with his own personal trainers or Bumgarner calling the shots when and where he wants to pitch – until perhaps now. 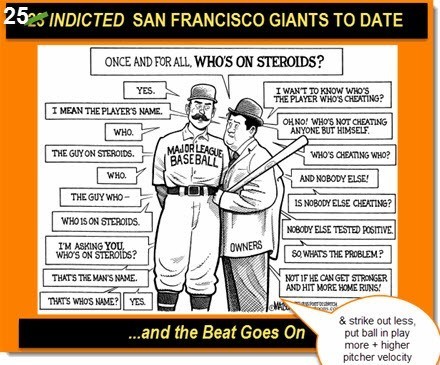 That the local SF media was afraid to ask the Giants pointed questions -as in the past – they didn’t do it again and let the Giants off the hook again. We may never know why a blazing Bumgarner didn’t wrap up the game with a likely win but was instead taken out. For his temperament? Again, we may never know but it cost the Giants after they had to go to their weak bullpen, which blew up again. Though the topic of PEDs and steroids has largely gone away with improved and more frequent MLB drug testing this year, it’s still prevalent (10 major leagues and 50 minor leaguers indicted this year). At least the Giants with Bumgarner won their World Series -something Bonds’ teams never did- but at what future cost? 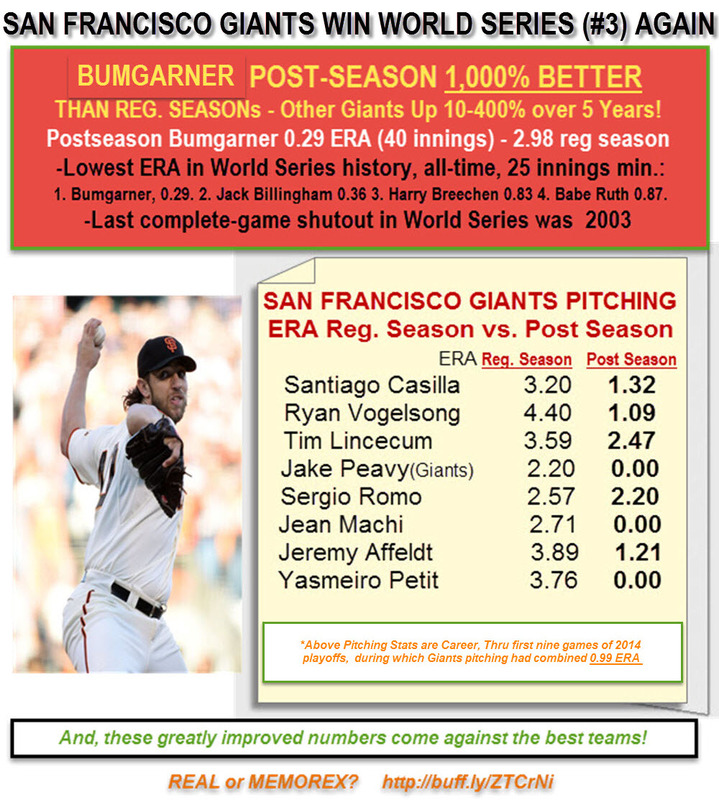 We’re not saying Bumgarner also parallels Bonds with use of PEDs though t, frankly,it is a possibility, based not only on a similar ‘roid rage’ temperament but in an increasing output, eg 1000% improvement in the 2014 World Series over regular season. ..
What else would explain Bumgarner’s whole persona than ‘roids? 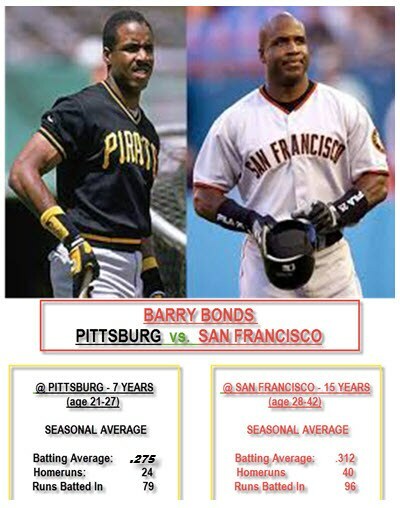 The only difference between him and Bonds is that Bonds head and body grew but today there are many PEDs that will give one performance without significant body change. Bumgarner even telegraphs ‘PED’ use more than Bonds by his repeated improvement at playoff time against better caliber talent. If anything his performance should decline in the playoffs, but it’s improved all three World Series, along with several other Giants, notably Hunter Pence and Pablo Sandoval. If Bumgarner can be so great in September and the post season why can’t he do it during the season, where he’s had nearly a 4.00 ERA the last 10 games of 2016? The fact is that players can pop pills or take injections at will, depending on drug test time, which has increased significantly this year; perhaps the second half of the season has seen more of these ‘random’ tests (even though they’re announced well ahead of time). Not only has Bumgarner’s pitching improved again this late season, but he’s suddenly been hitting the longest, mammoth homeruns in batting practice, according to media reports. Fewer Giants may be taking advantage of PEDs this year due to more drug testing, but , in our opinion, Bumgarner’s one who IS likely using at least some of the time, based on recent sudden improved performances, again, following his past late season track record. With more frequent drug testing this year, the ‘not dumb or dumber’ players have had to refrain from using PEDs more often. Perhaps there were more tests given during the second half of the season; that along with the giants playing better teams could help explain their sudden, incredible drop-off, from first to worst record . Yet, people still call Bochy a ‘Hall of Fame’ manager and continue to play the ‘World Series card’ now two years after their last one. Giants loyalists (aren’t they all ?) like Duane Kuiper who even today after the latest blow-up says the Giants wouldn’t have been in the World Series without Bochy. Without their PED players Melky Cabrera (2012), Andres Torrez (2010). Michael Morse (2014) – and more- they wouldn’t have been in the World Series either with those guys singlehandedly giving the Giants more than enough game-winning hits the time they were around – not to mention the non-indicted bus suspected Marco Scutaros, Cody Ross’, Aubrey Huffs, etc . Then there was the pitching and a whole raft of likely suspects who came over from Kansas City Mijares, Blanco, Guillen, Cabrera, etc. Even if the Giants, who’ve made a science out of PEDs-knowing how and when to use them in the great training land of Bonds ,Balco and Conte (Victor , not former trainer Stan who was another victim of Giant Shadows)- were able to PEDdle back into the playoffs, the next years will be difficult with a depleted farm system and long-contracted, over-rated veterans who will take up valuable roster space for new acquisitions – not to mention the cost. 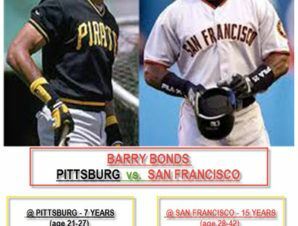 Sometimes even PEDs don’t always make the difference as with Bonds’ teams, on which there were many PEDs users ( Aurilia, Williams, Santiago, etc.) we only know of because of the Mitchell Report. Today there’s no new Mitchell Report so nobody really knows who’s using and who’s not but other teams have certainly taken to what they saw give Bonds and the later Giants so much extra boost and eventual success. Maybe that’s part of it too. Other teams have diluted the PED pool . If many others are using them other teams numbers are going to go up too. Already, this year has seen a dramatic rise in homeruns – seemingly everywhere but, ha, San Francisco, though , PEDs are not only good for hitting homeruns. Anything to do with power and hand/eye coordination can and will benefit from PEDs. So, right now, there’s a big question mark for the future of baseball. You have the Giants being brought down to earth probably by that little dirty secret that reduced them there while you have no dominant teams, other than , perhaps, the Chicago Cubs. Even the strong Boston Red Sox have been fuelled largely b y a ‘nice guy’ 40-year old pinch hitter who few question anymore as to his sudden increase in output after the age of 35. Then there are still the ones we know from the MItchell Report doing their thing and some new unlikely names hitting above their body size. With a commissioner enjoying the benefits of the new power surge we’re unlikely to see any further push for continued improvements in drug testing anytime soon. And, so it goes….